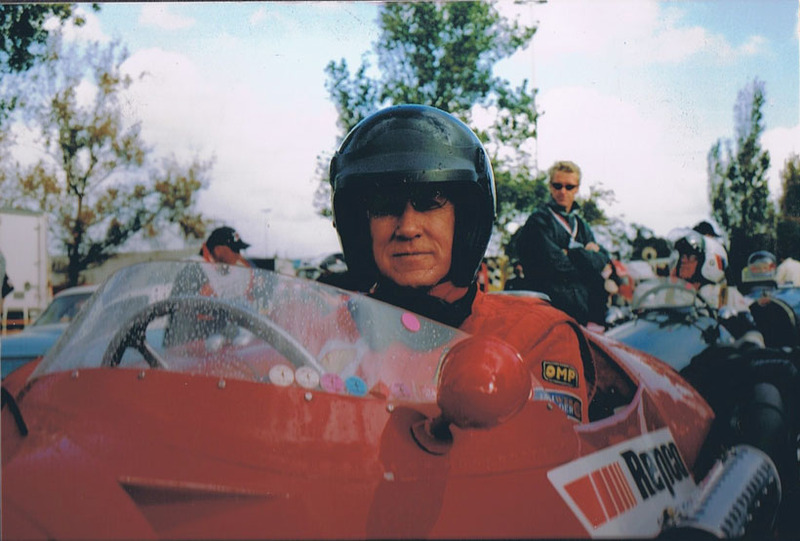 Born in Eastbourne, England, but living in California for many years, Peter became interested in sports and competition cars in the late ‘50s. His first car was a 1932 BSA air-cooled three wheeler which he managed to qualify as a “motor cycle combination”, as he was not yet old enough to have a drivers licence for a car. Graduating from the BSA to a Brooklands Riley 9, Peter then owned a succession of chain driven 1920s Frazer Nashes, one of which he restored in the living room of his home! Subsequently Peter has rebuilt/supervised the restoration of a number of historic landmark racing cars, including the 1924 Lyons GP Bugatti, the Frazer Nash Union Special, several Monza Alfas, two Talbot Lago GP cars, two dual supercharged 8 cylinder Alfa Romeo Tipo B “P3s”, two Tipo C 8C-35s, An Alfa Romeo Alfetta 158, a Bugatti Type 59, and a Maserati 8CM and Maserati 250F. More recently, he had historic Lancias restored, including a Lancia D24 and the very unique Lancia D50A/r. Peter’s first visit in 1958 to Goodwood, Sussex, England (his local racing circuit) was by bicycle, his only method of transportation at the time. There he fell in love with Maserati 8CM #3011 (ex Whitney Straight/ Prince Bira). Black and white photos of this car adorn his early scrap books. Little did he know that 40 years later he would be its proud conductor! In 1959 Peter began his racing adventures in a 1928 Frazer Nash. This car cost around U.S. $500, and gave a great account of itself at circuits and hillclimbs such as Silverstone, Brands Hatch, Goodwood, Crystal Palace, Oulton Park, Firle, Bodiam, and Wiscombe. The Frazer Nash developed 115 bhp, weighed 1100 pounds, with its chain -drive had no differential, and provided neck snapping performance. It was driven to events in all kinds of weather, as the Frazer Nash was his only form of transportation at that time. By 1961 Peter had qualified for a full FIA international racing licence. 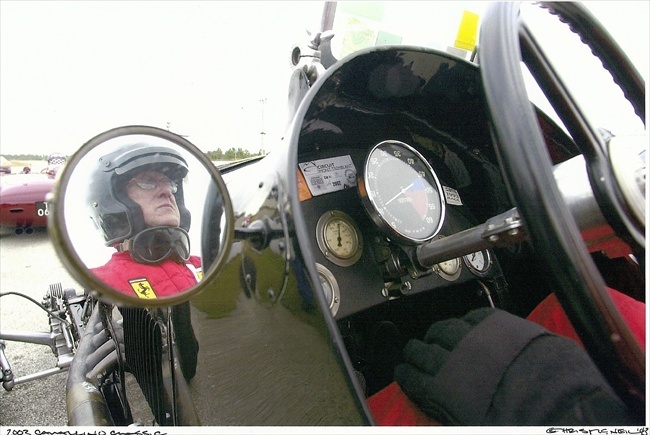 In Peter’s second supercharged Bugatti Type 35C at the Kannonloppet in Karlskoga in Sweden, he beat most of the later and more powerful ERA and 250F Maserati racing cars, and in the late 1960s he campaigned a 196 SP Ferrari (rear engined, with the famous “twin nostril” nose, ex Rodriguez brothers). 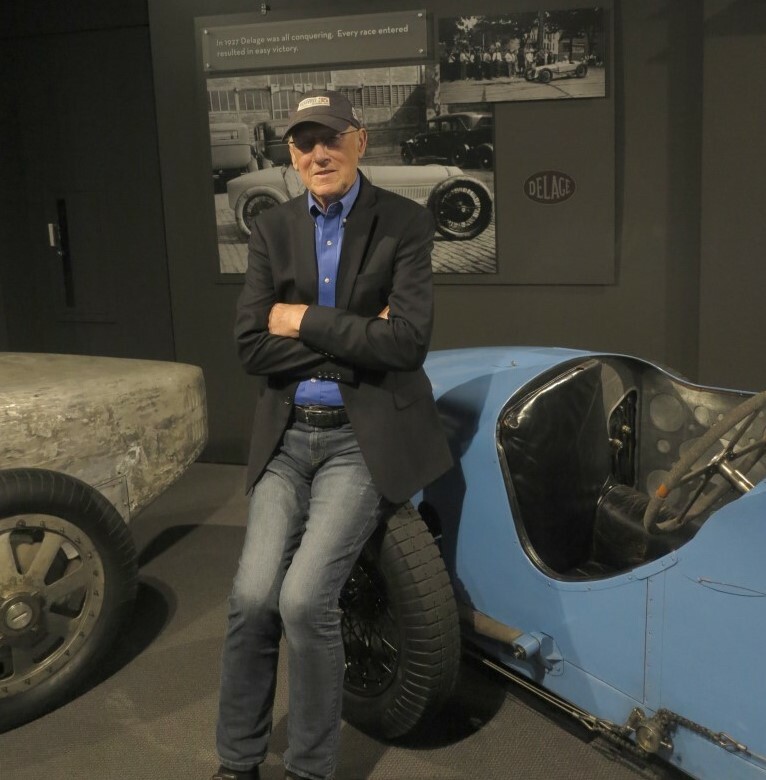 In his third Bugatti (the famous 1924 Lyons GP model) which he restored from a pile of bits found on a farm in Spain, Peter collected second fastest time of day at a Ferrari club event at the Bridgehampton track, Long Island, New York. In 1985 Peter drove his Alfa Romeo Monza (#2311218) and Scuderia Ferrari Tipo B “P3” (#50001) to such good effect at the Monterey Histroics that he won the coveted “Phil Hill Trophy”, which was presented to him personally by the great Juan Manuel Fangio. In addition, for winning more vintage/ historic events in his vintage Alfa Romeos than anyone else in the world, Peter was awarded the Italian Scuderia del Portello Trophy. In 1986 Peter was chosen to race the priceless 1937 Mercedes Benz W-125 during the marque’s “spotlight” at the Monterey Historics. 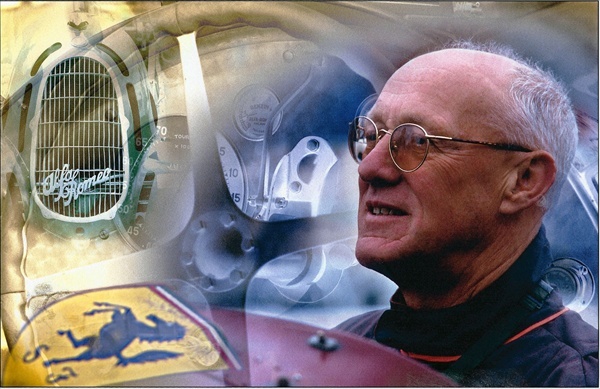 Since then Peter has won many honours and awards, including the Sam Hanks Sportsmanship, together with the Christies, La Carrera Mexican road race, VARA champion, Tom Sulman, Rene Dreyfus, Monterey, Diehard, Asprey, Girard-Perregaux, Shell Ferrari Historic Challenge, Pete Lovely, Chopard, Spirit of CSRG, Cavallino, 2 x Bugatti Grand Prix, Lake Forest Motors “Oscar”, Ferrari Challenge Masters Award, 5 x Trofeo de Florida, Louis Vuiton, New York Governors Cup, Charley Gibson, Road & Track, and Rolex Trophies, and has recently been inducted into the Road Racing Drivers Club and was honored as 2010 Motorsportsman of The Year by the Motorsports Press Association (MSPA). 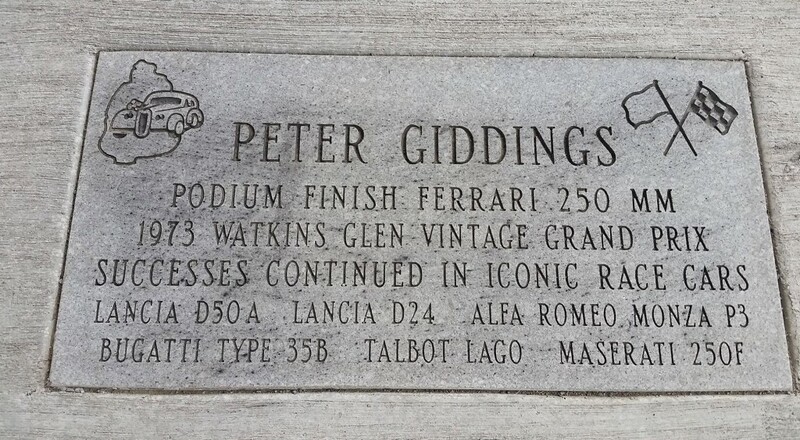 In 2018 Peter was awarded a marker on the Watkins Glen Walk of Fame. Recently Peter was campaigning Alfa Romeos and Maseratis in the Ferrari Historic Challenge Series, winning drum division in 1998, 1999, 2000, 2001, 2002, 2003, 2nd in 2004, 3rd in 2005, 2nd in 2006, 2nd in 2007, 3rd in 2008, 1st in 2009, 1st in 2010, 1st in 2012, 1st in 2013, 1st in 2014, 2nd in 2015, 2nd in 2016, and 2nd in 2018. This series pits Peter in his early cars against competition Ferraris and Maseratis of more recent vintage such as TDF, 250 GT, 410, 335, 250TR, 250MM, 500TRC, 625LM, 375MM, 250SI, A6GCS, 300S, and 450S. Peter often manages to finish ahead! 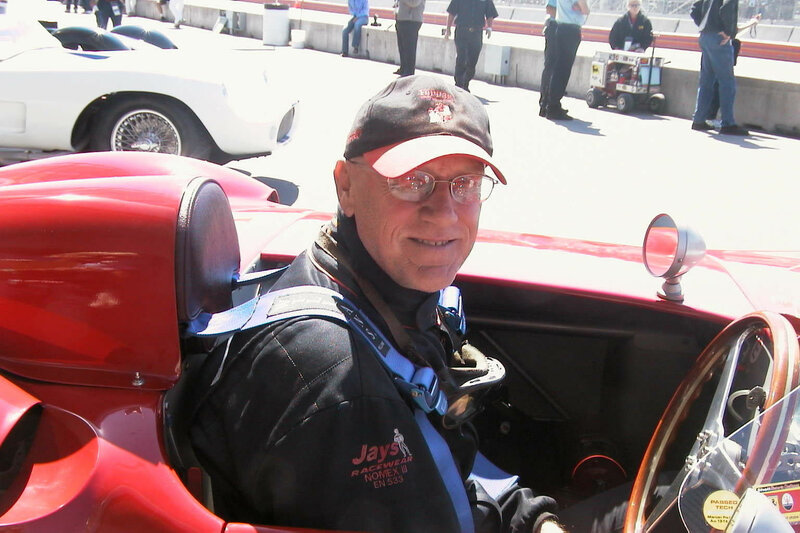 Peter has now raced most of the “Titan” 750kg Grand Prix cars, including the Mercedes W-125; Monza, Tipo B and Tipo C, Alfas; Bugatti 51, 35B and 59; and Maserati 8CM, in the U.S.A, Europe, Mexico, Canada, Bahamas, Thailand, Australia and New Zealand. As a several times champion of the North America Ferrari/ Maserati Historic Challenge, Peter reached the pinnacle of official "Grand Master". 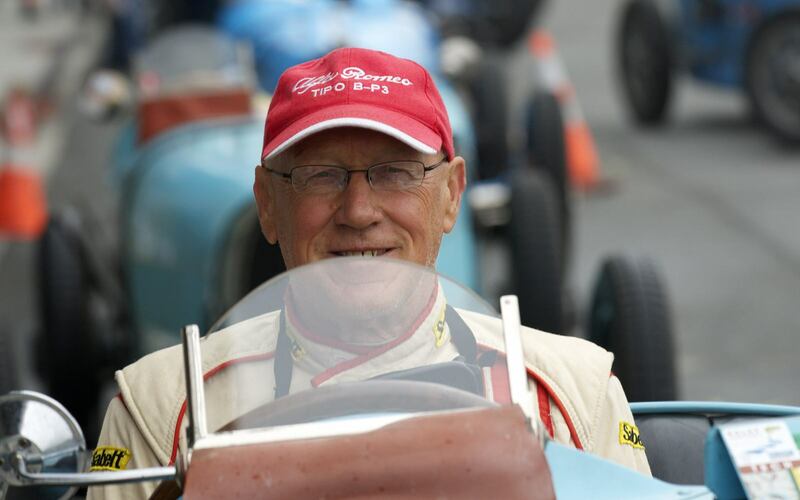 Since the Australian Grand Prix recommenced first in Adelaide, and now in Melbourne, Peter has competed in the supporting events with one of his historic cars, including his 1956 AGP winning 1953 250F Maserati (#2501/2523). 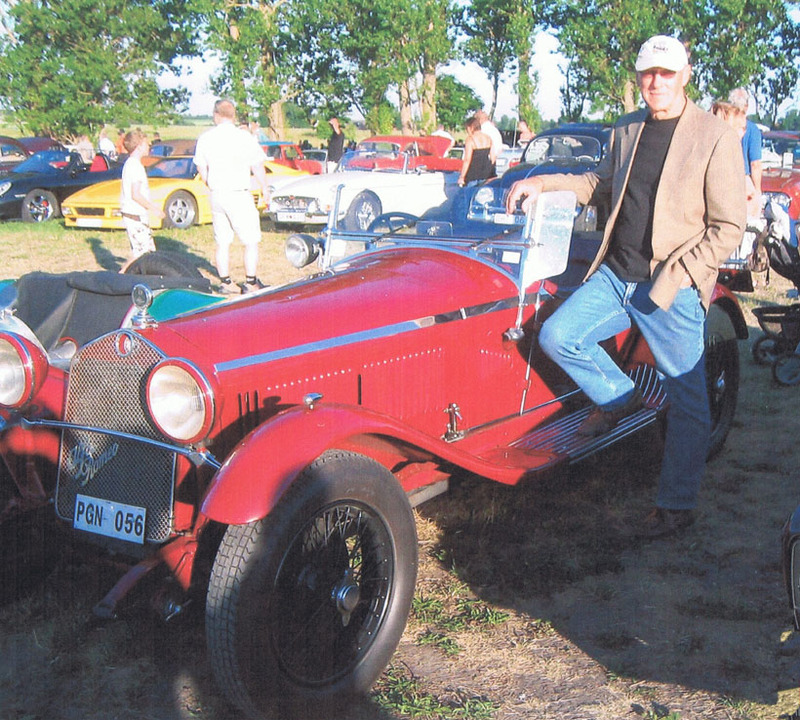 Peter, along with his supportive and enthusiastic wife, Judy (their honeymoon incorporated participation with their 1928 Alfa Romeo 1750 in an Italian race and rally) spent many years racing historic Grand Prix and sports racing cars so that spectators and enthusiasts could experience the sights and sounds of this historic period. After bravely battling cancer, Peter passed away peacefully at home on January 6, 2019. Peter at the Rolex Monterey Motorsports Reunion at Laguna Seca. Photo by Dennis Gray. Peter in Maserati 300S #3057 at the 2005 Monterey Historics. Photo by John R Wright. 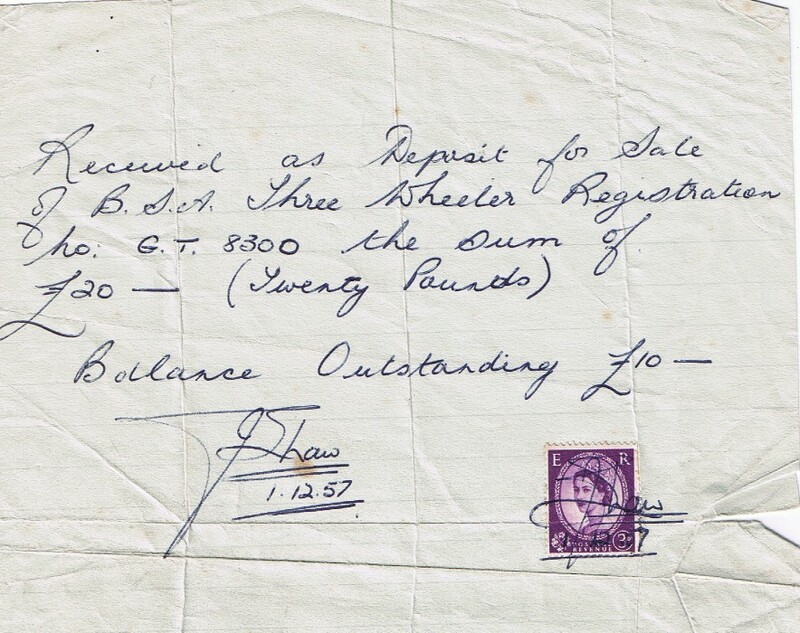 Bill of sale for Peter's first car, a 1932 BSA three-wheeler. A montage created by Peter's friend John Lamb of New Zealand. Another great photo by Chris McNeil. This time it's of Peter in Maserati #3011 at Cavallino 2003, Florida. 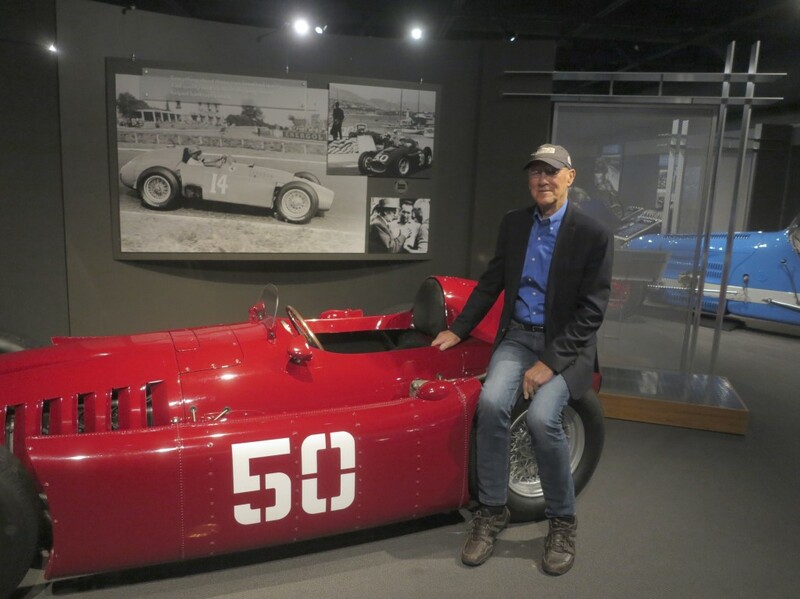 Peter with a Lancia D50 at the REVS Institute. 2018. Peter with a Delage Grand Prix car at the REVS Institute. 2018. 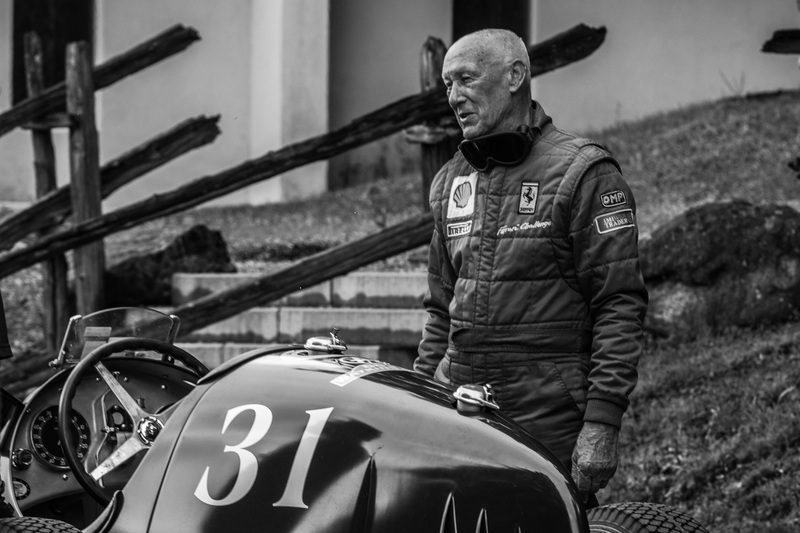 Peter with the Alfa Tipo C. Photo by Francois Thiebaut.